Can you tell which (crinkly) product is the most used & loved? I want to start this post by clarifying that I am not a trained dermatoligist or esthetician, so if you're experiencing serious skincare issues, please visit a professional! These are all techniques that have worked well for me. Also, it's important to spot-test new products before using them on your face, because you never know what you could be allergic to. Just to quickly sum up my daily skincare routine: In the morning, I splash my face with water & use a moisturizer and sunscreen before applying makeup. At night, I remove makeup with Bioderma, followed by a cleanser, Clarisonic every other day, moisturizer, eye cream and acne spot treatment as needed. 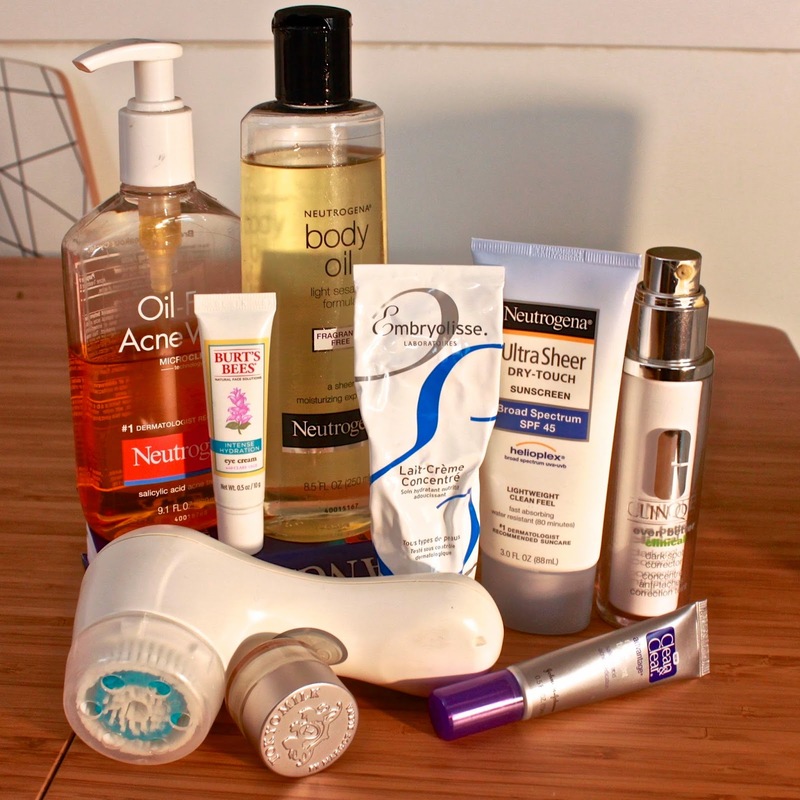 Below, I've listed my Do's and Don'ts of skincare; the Don'ts are things I used to do, thinking I was doing my skin a favor, and the Do's are the corrections I've made to those misguided routines. My skin mantra today is "exfoliate, moisturize, exfoliate, moisturize..." A friend recently told me that my skin was glowing, so I think it's going pretty well! I have a Clarisonic Mia that I used every other day. I was lucky to get a gift certificate that I used to purchase this, but they are pricey and frankly I'm not sure I would've splurged on one without that gift card. That said, I'm very happy with it and would save to repurchase another if it ever breaks. If you're not ready to invest, there are some lower-price options at the drugstore; or you can gently (did you see me italicize gently? Because I mean to emphasize gently) use a washcloth on your face while in the shower. There are also options for chemical exfoliation; sounds scary, but doesn't have to be! Start with something gentle like this Dermalogica Gentle Cream Exfoliant which Lisa Eldridge recommends. She has some great recommendations for other masks, as well, that I'm itching to try myself. Huge mistake I used to make. If you're only using salicylic acid and benzoyl peroxide on your skin, your skin could break out more due to that over-dryness. Again, your skin should never feel stretched tight across your face. Also, stripping your skin can overstimulate its oil production, making your face even more oily. At night I'll follow my favorite moisturizer (Embryolisse's Lait-Créme Concentré; more on why below!) with Clean & Clear's Advanced Mark Treatment where I need it. They'll only be on your face for a few seconds! In the winter when my skin gets dry, I like cream cleansers like Burt's Bees Sensitive Facial Cleanser with Cotton Extract. I'm more prone to acne when it's hot and humid out, so I switch to Neutrogena's classic Oil-Free Acne Wash with salicylic acid. The reverse logic applies here: if it's going to stay on your face for a while, it's probably worth getting a quality product. Buying Embryolisse's Lait-Créme Concentré was one of the best things I've done for my skin in a while. I had been using drugstore products that seemed OK when first applied, but left my skin parched by lunchtime. This stuff is a giant glass of water for my skin, and it smells like milk and cotton (sounds weird, but it's very soothing). This is a somewhat heavy cream, so in the summer it may become my night cream, and I'll find a moisturizing serum for daytime. Don't Skip Sunscreen Just Because Your Foundation/BB Cream Has An SPF! The SPF in those products is a great bonus, but it's not enough to truly protect your skin. I like to splash my face with water and apply moisturizer & Neutrogena Ultra Sheer Dry-Touch Sunblock SPF 45 as soon as I wake up. By the time I've had some breakfast and watched the previous night's The Tonight Show, those products have sunken into my skin & I'm ready to apply my makeup! This is the most delicate area of your face, and it needs extra moisture. This is particularly true if you wear a lot of eye makeup; brushes & liners tugging at the skin around your eyes and makeup removers stripping it off at the end of the day leave this area extra sensitive. I like Burt's Bees Intense Hydration Eye Cream with Clary Sage. Clinique's Even Better Clinical Dark Spot Corrector: OK, full disclosure: I ordered an eye shadow palette from Sephora around Christmas and they sent me this instead. They eventually sent the correct product and told me not to bother sending it back. Score, because this stuff is $80 at Sephora, and there's no way in hell I would've bought it on my own. I do find this useful for reducing redness from fading acne, and I think it helps a bit with the redness on my cheeks. I don't use this when I'm actively breaking out, because I'd think it'd just make that worse. Jury's out on how long-lasting the redness-reducing effect will be once the product runs out. Tokyo Milk Rose Water Bon Bon Lip Balm: I'm a sucker for rose-scented anything, and this goes on like butter. Pacifica Body Butter in Persian Rose: Again with the rose. I feel like I've just gone on vacation whenever I smell this. Neutrogena Fragrance-Free Body Oil: I don't moisturize my legs and arms as much as I should, but this product is so un-greasy and light that it's encouraged me to moisturize more! I've been wanting to try the dry-brushing trend but I keep forgetting to buy one! Stay 'tooned for when I get around to trying one. Last [personal] note: As I said at the top, for any of you that are experiencing severe acne or cystic acne, you should consider seeing your doctor or a dermatologist. Most over-the-counter treatments won't be effective for you. A couple years ago, I went through about 6 months of terrible cystic acne, leaving 8 to 10 painful, red lumps around my mouth & chin all the time that made me embarrassed to leave my house. I bought Proactiv thinking it'd make butterflies fly out of my nose, hated it, and then went to the doctor. She prescribed an anti-bacterial medication that helped a lot. Hope you found this helpful, and please comment with your favorite skincare products and techniques!